Earn $20.99 in Rewards credit (2099 points) What's This? Race proven performance and widely celebrated as on the most comfortable clip on aerobars on the market. Recently redesigned with a strong and lightweight carbon weave. 170mm-290mm adjustable extension with a 6061/T6 forged aluminum bracket featuring Z® arm technology for a great climbing position. Fits 26.0mm and 31.8mm handlebars. 520g. Highly recommended. These bars have lots of adjustability making it easy to get the right fit. The width and height of the arm pads, the width, height and angle of the extensions, and the overall angle of the bars are all adjustable. The hand position is comfortable for long periods. I used these bars on a 3400 mile ride across the country and found them comfortable enough to spend most of my time using them. The arm pads don't flip up like some bars which makes it hard to use the tops of your bars when these are mounted. However, the arm supports are much stronger and more durable than the flipup type. places you in the perfect position for long fast rides. Light weight , easy to install and a joy to use. I have tried other aero bars and these are the best. I do a lot of riding along the coast and they hold up well in this environment. I have these on both my bikes. My first aerobars. I bought them for the Tejas 500, which I haven't ridden yet. 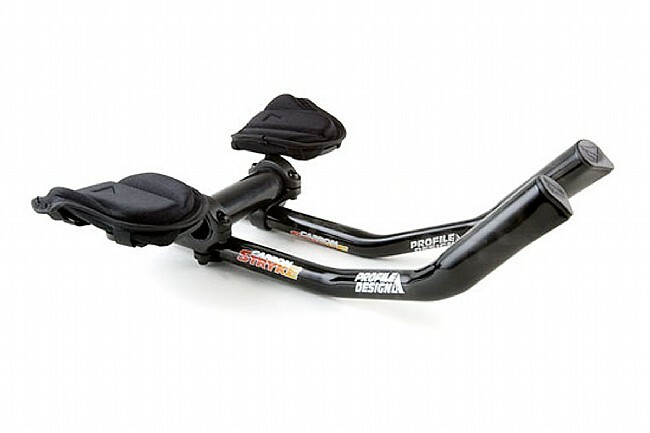 I bought both the Profile Design Jammer aerobars andthe Carbon Stryke aerobars to compare. I love the the Carbon Stryke bars - very comfortable in training and acclimation rides to date. I added to the padding with gel under the stock pads. I don't quite get the Jammer bars. The are meant for a more upright position, but they are so short I had trouble finding a really comfortable position. But the Carbon Strykes I find very comfortable.